Are you a good seamstress? Do you have a beach blanket bingo theater production coming up? Need to make patterns from vintage swimwear? Does your beach cottage need new art for the walls? If so we've just launched a lot of 15 vintage swimsuits on our website at glamoursurf.com. These pieces are in need of some special attention, some very minor, others require a bit more work, but all are truly vintage and fun. We've even included a couple of rubber swim caps. The swimsuits range from the 1930s through the 1970s with most of them in the 1940s and 50s. 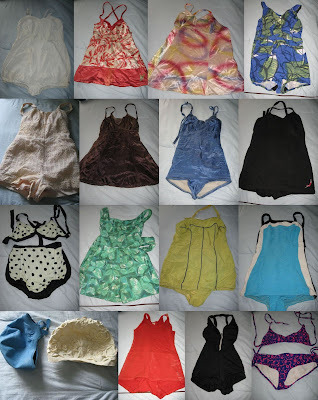 Satin, cotton, wool and rayon jersey, eyelet, prints, play suits, one pieces and two piece bikini's. Click on the image to go direct to the listing and help these beauties find a new home! does any one know how much this bathing suit runs for or where I can get one at? I want the true 1950's jantzen one for my wife, she love this stuff. Here is the link to what I am talking about. We are going to be listing one of these very soon on the site, glamoursurf.com. We specialized in vintage swimwear. A Beach Coverup Shall We Say?